I deliberately wrote “Why We Are In A Golden Age For Appreciating Superlative Hand-Finishing . . . ” because, the fact is that if many people do not appreciate superlative hand-finishing, then fewer will pay for superlative hand-finishing, so there is likely to be less superlative hand-finishing on offer. We are in a golden age of appreciating superlative hand-finishing because . . . It is absolutely no use making anything from a commercial perspective if nobody knows your product exists. And if something is not approached from at least a somewhat commercial perspective then we are unlikely to see much of the product. No matter how great the art or craft is, if the world doesn’t know it exists, then that art or craft is unlikely to thrive. The internet has enabled a significant percentage of the world’s population access to relatively arcane and esoteric information like watches and horology. Thanks first to discussion forums, then blogs, and now social media, there is a potential global online audience for anything interesting, informative, or entertaining enough to catch our attention. The internet has made a large appreciate audience for superlative hand-finishing possible. And the internet isn’t likely to be going anywhere soon, so this looks to remain a relatively stable factor in the future. We have our potential audience, but it now needs to be educated to be an “appreciative” audience. And for that we have to thank the internet again. We (ourselves, brands, and even individual watchmakers) can share information among each other in real time (or not far off from it) using blogs and social media. And offline we have more magazines and events than ever before. Then we have digital photography and smartphones, which have made sharing high-quality photos (even macro) and, more recently, videos relatively easily (though this still takes considerable practice to do well). Then there is the factor of the superlative hand-finishing itself. While opinions may differ − who am I kidding, opinions will certainly differ − I’d credit the launch of Philippe Dufour’s Simplicity and the Independent forum on ThePuristS (which was my horological home for many years) as bringing this subject to the attention of an (at the time nascent) global horological audience, including both excellence in finishing and why it’s something worthy of note. While I know mentioning anyone is likely to annoy even more people not mentioned, in addition to the best hand-finishing from haute horlogerie brands like A. Lange & Söhne and Vacheron Constantin, we also have smaller players including Philippe Dufour, Kari Voutilainen, Jean Daniel Nicolas (Daniel Roth), Romain Gauthier, and Greubel Forsey to name just a few. These brands are ensuring that the knowledge of the craft of superlative hand-finishing burns brightly. So we have a large audience with easy access to information and quite a few watchmakers offering fantastic levels of finish. What could possibly go wrong? And why might that change? 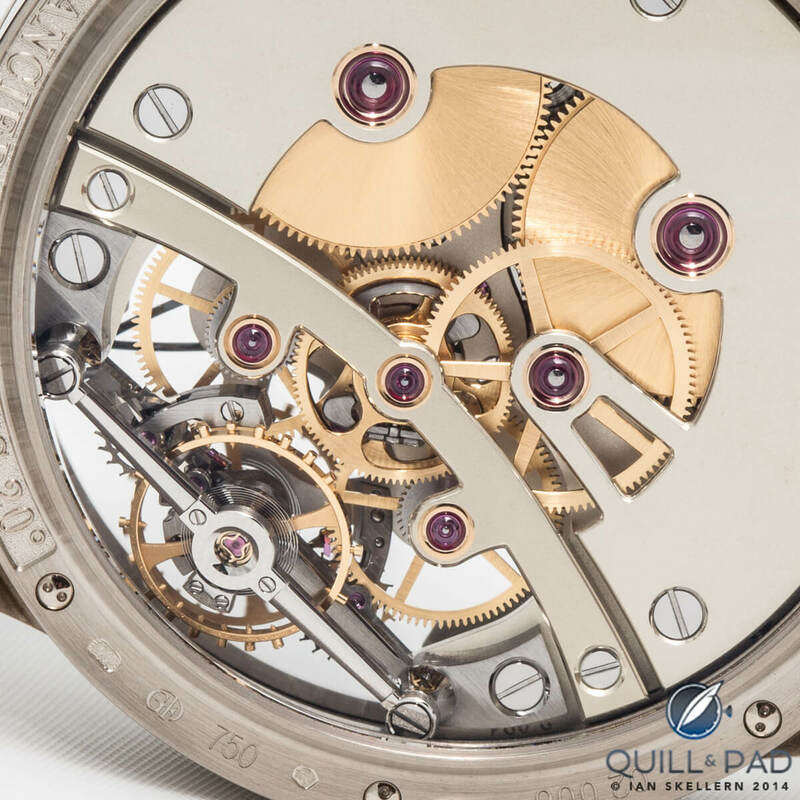 One of the key factors (if not THE key factor) to note in this discussion is that at present, the very best hand-finished watch movements are the very best finished watch movements period. Machines cannot finish watch components as finely, as subtly, or as distinctly as talented men and women with a file. And that’s down to one main technological constraint: the business end of machines (meaning the tools doing the milling or polishing) spin, rotating at high speed. In comparison, human hand-finishing uses a reciprocal back and forth motion. The rotary motion of machines means that small vertical lines can be seen on any machine-polished anglage, AND spinning tools cannot polish a sharp internal angle. Which is why so many brands that put emphasis on superlative hand-finish deliberately design movement bridges and plates to include multiple internal angles. So until now, only the human touch offers the very best movement finishing. But what if that wasn’t the case in the future? What if somebody developed a CNC tool with a reciprocal motion? Then there would be no impediment to machines creating fine finishes at least to the stand of the best human hands and likely much better. Superlatively hand-finished watches are expensive. Very expensive because hand-finishing is very labor-intensive and the skill is relatively rare. But collectors, who both appreciate superlative hand-finishing and can afford it, can justify (at least partially) their purchases because they can be confident in having not just the best hand-finishing, but the best finishing altogether. However, if − and I’m tempted to use “when” instead of “if” as it is surely just a matter of time − machines can finish better, can we be confident that as many collectors will be willing to pay as much for what is not no longer the world’s best finishing, but only the best hand-finishing? Vinyl records survive not (just) simply because of nostalgia, as powerful as that is, but because the quality of the music is significantly better than the mp3 format of most digital music. Whether the listener has a fine enough ear to hear or appreciate the difference between the music formats is neither here nor there. The fact is that records do offer (when partnered with a good turntable and amplifier) a much better quality sound than mp3. Now, a few astute readers may bring up the very valid and pertinent point that watch brands are no longer selling the best of anything, but rather “luxury,” an altogether more intangible feature. Even the very best modern mechanical wristwatches are nowhere near the accuracy or reliability of (much cheaper) quartz models. But the industry is thriving (at least over the medium to long term) because collectors are buying luxury rather than practicality. And I get that. However, superlative hand finishing has become an essential factor in the highest-end timepieces, and if the meaning of superlative changes from “surpassing all else” to “surpassing all else except the ubiquitous mechanical finishes found on much cheaper watches” then I can’t help but feel that the appreciate audience that is so essential for superlative hand-finishing to maintain its present size is likely to shrink. And if the audience − meaning potential market − shrinks, then the number of superlatively finished watches is likely to shrink, which will lead to fewer watchmakers and brands dedicating resources to creating the very best hand-finishing. Which is why I think that we may be in a golden age for appreciating superlative hand-finishing in that we have the access, the information, and the hand-finished watches themselves. Please note that I am not predicting the end of beautifully hand-finished watches, as there will (hopefully) always be a few watchmakers who will want to excel, but probably not as many as now. And there are not that many now. Long may this golden period of hand-finishing last . . . because it is likely to come to an end, and the end may be sooner rather than later. This article begs many questions, but ultimately, I believe there will always be a desire for hand-made work. I think many covet high-end pieces because they are hand-made, not because hand-made necessarily produces the best possible result. Speaking of vinyl (why oh why did you open that can of worms;)), what many perceive as better sound is really due to minute imperfections in the medium – vinyl degrades and is altered over time (like with all analog information), and the signal path is inherently more lossy (vs CD) due to the longer analog chain. This is sort-of similar to collectors preferring the organic look of hand-applied Geneva stripes vs “perfect” machine striping. Collectors like unique things, things with character. This won’t change. (And FYI, I’ve never heard of anyone arguing vinyl vs mp3 – it’s always been vinyl vs CD, and an identically mastered CD is unarguably a more accurate representation of the artist’s studio performance compared to a vinyl record – and the gap only widens as the record ages). Thank you for the thoughtful reply, Stef. I agree with you that there are sure to always be those who appreciate high-quality, handmade work and that are willing to pay for it. My point, though, was that those people may be much fewer in the not too distant future. I didn’t mean to sound the death knell for high-end hand-finishing, but to point out that we may well be in a golden age of appreciating high-end hand-finishing and that there may be less of it it the not-too-distant future. That said, as the world gradually (on average) gets wealthier, the increase in potential clients may mitigate or even outweigh the factors I highlight in this article. a. Most music today is being listened to as mp3 files rather than from CDs. b. The compression of mp3 files makes the sound quality noticeably poorer in comparison with vinyl (unlike with CDs as you point out). But do bear in mind that it does not matter if records are technically inferior to CDs, the fact that they are “perceived” to sound better is enough. Agreeing with your last comment – it’s about perception, not measurable metrics. Also, should machine-finishing equal (or surpass!) the flourishes we value today, what constitutes superlative could very well change. E.g. with the advent of cameras, painters no longer aspire for photorealism. I guess I’m not arguing against the hypothesis of your article. This very well may be the beginning of a Golden Age of superlative finishing as we define superlative today. Agreeing with the other commenter, vinyl is a technically inferior medium compared to compact disc. Compact discs simply have more dynamic range available because of the vinyl version must be carefully mixed to prevent the stylus from jumping out of the track. The move to compact disc gave audio engineers far more latitude in jumping quickly from soft to loud and back, which is part of the reason classical music sounds so much better on CD. Now, the loudness wars of the 1980s-present resulted in a reduction in dynamic range during the mastering process, so most popular music these days has been acoustically compressed to *not* have big jumps from soft to loud. This is purely a commercial/mixing decision and not technical flaw with mp3 or cd. Sometimes with modern releases the vinyl versions are from a different master that has not been made a victim of the loudness wars, the theory being that people buying vinyl these days are “audiophiles” and care about a better mix, while people buying cds/digital downloads want the same thing they would hear on the radio/in a club. Vinyl is in every technical way inferior to compact disc (and thus high-bitrate MP3, AAC, etc, since if you think you can reliably tell the difference between 320kbps mp3 and CD across a dozen random tracks in an a/b/x test I have a bridge to sell you). What most people like about vinyl are the flaws (the “warmth” from the background noise) and the misguided belief that they’re listening to a superior product. The only time the vinyl version is truly better is when it’s a different (better) mix than the digital version, and then you’re just comparing apples to oranges. I never compared vinyl with CDs in the article but with mp3 files.